In Commercial Observer list, Gilmartin joined by LaRue, not Ratner. 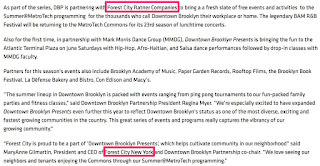 Forest City NY succeeds Forest City Ratner. 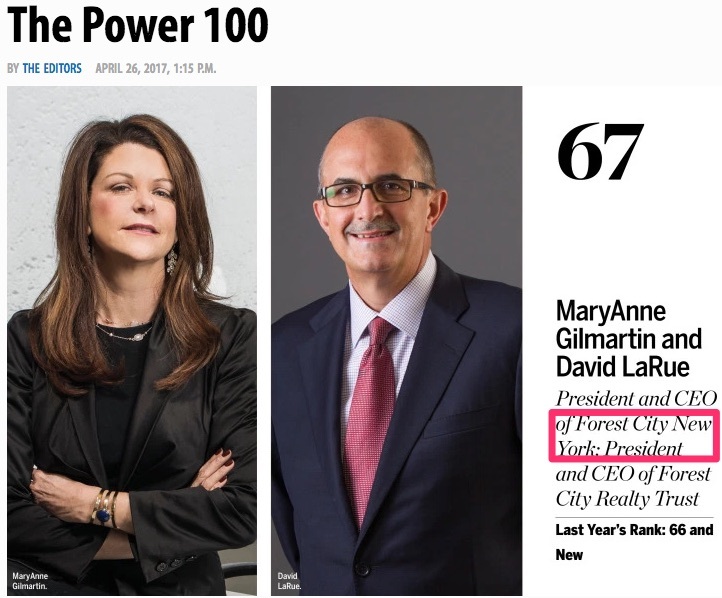 The Commercial Observer's Power 100 two years ago ranked MaryAnne Gilmartin and Bruce Ratner separately, at #79 and #73, and last year ranked the two leaders of Forest City Ratner together at #66. This year, ranked #67 are Gilmartin, described as President and CEO of Forest City New York, and David LaRue, President and CEO of Forest City Realty Trust, the parent company based in Cleveland. That indicates a double Ratner diminishment of sorts. First, Ratner, the New York firm's Executive Chairman, no longer makes the list. Well, he's been winding down somewhat, and has taken harsh criticism from activist investors. 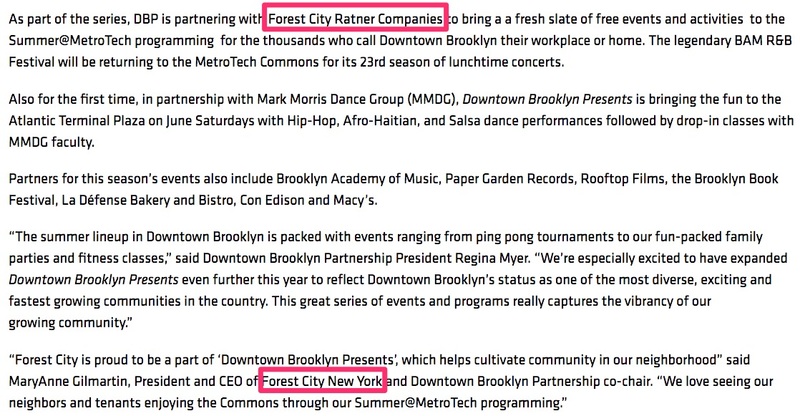 But what's up with "Forest City New York"? That's an understandable strategy--most but not all subsidiaries of Forest City Realty Trust have long been identified by city, such as Forest City Washington and Forest City Boston. But it also represents a distancing from the family that long controlled the parent company and the family member who ran the New York branch. So that positions Forest City as less of a family-run company and--as with "Pacific Park" replacing "Atlantic Yards"--it means Google searches are less likely to turn up any past troubles and controversies. But Gilmartin is more focused on the positives; the company is nearing completion on Pacific Park’s 278-unit residential condominium building at 550 Vanderbilt Avenue, which she said will cater to an underserved condo market in Brooklyn. “If you’re building condos on 57th Street, you’re probably uncomfortable with some of the price points today,” she said, noting that Forest City is building units at a $1,500 per square foot “sweet spot” in the Brooklyn market. Yes, but sales are slow, and some of those underserved buyers are from China. The piece ends with Gilmartin, again, bringing up plans for a ground-up office building at Site 5, identified as 590 Atlantic Avenue (currently home to P.C. Richard). There's no formal proposal yet--Forest City and P.C. Richard are still wrangling in court--but Greenland Forest City Partners has a very ambitious plan for a two-tower project. Go Maryanne! True role model!